Home>Articles>Welding of steel gas pipelines: methods and general conditions. Welding of steel gas pipelines is quit complicated technological process. Welding service can be carried out only by certified welders who have valid (not expired) certificate. Before to start the main job a professional should weld a test joint which will be identical to realize a coming object. The welding of steel pipes requires a process flow diagram which takes into account the factors like diameter and the thickness of the pipes walls, direction of the welding and the positions of the joint. The sizes, constructional parts and types of the welded joints should correspond to the theses of the present article and to the GOST 16037-80. Underground gas pipelines are mounted only by angle and but joints. Correspondence to SNiP III-42-80 is obligative for structural dimensions of the grooving (required configuration) for the welding of the pipes with similar outside diameter but with different wall thickness. Joint displacement of the connected pipes is possible but only within the following dimensions: 0,15·S+0,5 mm where S is the thinnest wall jointed by the welding. A company which is in charge of the gas pipeline mounting should assign to the welders their own seals (number). 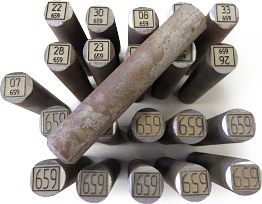 This numeric character should be obligatory embossed or overlaid on a side of the gas pipe accessible to check – 50…1000 mm from the welding joint. 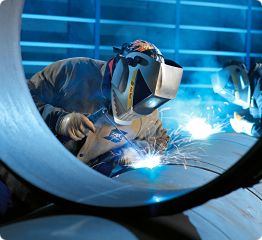 When the welding is carried out by two welders (the pipes of bigger diameter: more than 400 mm), each worker should emboss or overlay a seal inside the border of the realized area. For welding material (wire, flux, electrodes) it is allowed to use only certified goods. Welding materials are observationally checked to avoid the following defects: wire corrosion, damages on the electrode protecting coating and others. Materials with defects are sorted out.